Greens are springing up at area farms, and have arrived in abundance in our weekly CSA box, among them the youngest and most tender spinach. I reserve these young bunches of greens for one of my favorite recipes for spring: Buttered Spinach. While it may sound terribly uninteresting, it offers a story. 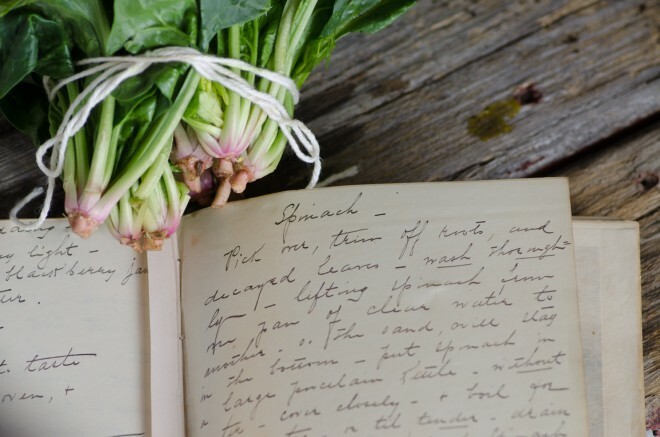 As I researched and wrote The Nourished Kitchen, I thumbed my way through old cookbooks in search of heritage recipes and old-world techniques that wanted revival. Among those books stacked high on my desk was an old journal, bound in red leather and gilded. A gift from a family friend who, like me, collects old things. I opened its pages, read them tenderly and thoroughly. The diary, dating to the 1840s and now worn, belonged a southern farmwife who journaled poems, household tips and recipes. The recipes read like notes: no quantities, and no times, just a smattering of thoughts paired together into a paragraph of sweeping cursive. Among my favorite of her recipes was one simply titled Spinach. Others include Blackberry Jam, and Cake. After adjusting quantities, and times, and making other adaptations, I thought to share it in my cookbook The Nourished Kitchen which focuses on wholesome, traditional foods and old world culinary techniques. 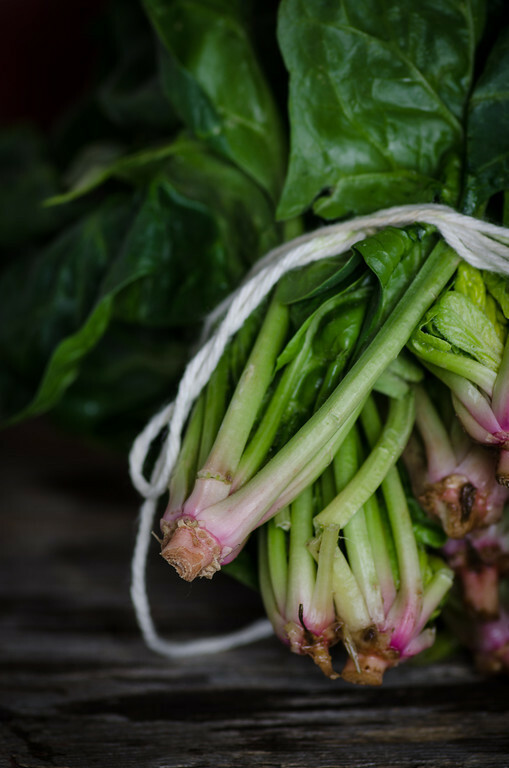 Preparing buttered spinach begins first by selecting tender, young spinach and washing them thoroughly to remove any sand and grit that can adhere to their green leaves and pink-tinged stems. Tossed into a pot, covered with a tight-fitting lid, and set over a low flame, the spinach releases its juice and wilts until tender, even without the addition of stock or water. Later, you press the cooked spinach to remove its juices, return to the pan and stir it with butter, salt, pepper and another springtime favorite – hardboiled eggs. 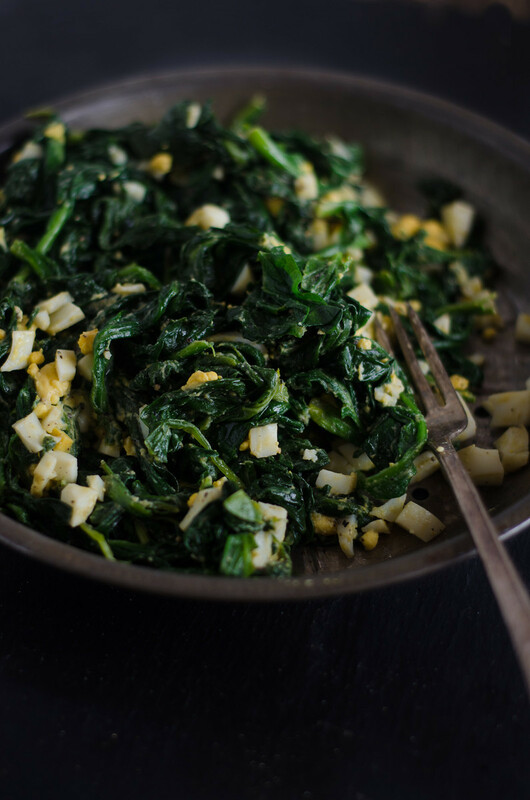 There’s a natural beauty to this pairing of butter and egg with spinach. Not only are both eggs and spinach foods of springtime, but melting butter into the utterly tender greens helps to make the antioxidants within spinach more bioavailable. That is, pairing fat (like that found in egg yolk and butter) with antioxidant-rich vegetables like spinach helps to better absorb the nutrients in the greens. Last week, my first cookbook The Nourished Kitchen came out, and it featured this recipe for Buttered Spinach as well as many other wholesome, traditional recipes with a bit of history behind them like Slip (a sweet clabbered milk), Portugal Cake (a dense sweet almond cake studded with currants and spiked with sherry). You can order The Nourished Kitchen here, and you would positively make my day. I first came across this recipe scrawled in the pages of an old journal given to me by a close friend. Dated 1846 and yellowed with time, its fragile pages describe farm chores coupled with the details of household management, favorite poems, and recipes like the one below, which specifies the use of young spinach, freshly picked, and, like most old recipes, provides few details on quantity. I’ve adapted the recipe, substituting white pepper for black. I make it often in the spring, when tender baby spinach arrives in our CSA box weekly, until the weather grows too hot and stifles the tender greens. This recipe comes from my first cookbook The Nourished Kitchen, released just last week. Trim the spinach of any tough stems or veins, then coarsely chop the spinach leaves. Toss the spinach into a large, heavy stockpot. Set it on the stove over medium-low heat, cover the pot with a tight-fitting lid, and cook for 15 to 20 minutes, until completely tender. Drain the wilted spinach in a colander, pressing it down to remove any excess liquid. Return the pot to the stove, add the butter, and melt over low heat. Toss in the spinach. Stir in the salt, white pepper, and minced egg, then serve. Thanks for sharing the recipe here! I ordered my cookbook the other day, and I can’t wait till it arrives to me! I think my mom used to make this a LONG time ago, and it was a passed down recipe. I can’t wait to try it again. Mmm spinach with butter and egg are just divine! Although, I usually scramble the egg in with the spinach while it is wilting. Another favorite we just recently discovered after planting waaaaay too many radishes. Sauted radish greens! Oh my! I chopped the radishes into rounds like for a salad and stir fried them & 1/2 a medium onion in a tablespoon of butter until they were all transluscent. Then I tossed in the (well washed, roughly chopped) radish tops. I turned off the heat and put a lid on. Then, right before serving, I put an extra tablespoon of butter. All the prickle of the raw greens was gone, and most of the “bite” from the extra hot radishes I grow left as well. Even my picky 15 year old loved them. For breakfast this morning, I had sauteed spinach and scrambled eggs; I cook it the way you do too. Thanks for sharing about the radish greens; I don’t like wasting them because they are so fresh from my garden but I could never eat them raw. It didn’t occur to me that cooking them would make them more palatable. Thanks to Jenny’s recipe for Blistered Radishes (which I was pleasantly surprised to see in Food & Wine magazine), I recently just learned to cook radishes with butter — my 6 year old loves them this way! Old cookbooks and recipes are fascinating, and this recipe is charming. I love the hard cooked eggs, what a great idea. Congratulations on the publication of your book! I love this and will definitely try. My Mother always cooked her spinach and added chopped hard boiled egg, a bit of brown sugar and some vinegar. Southern women never fail to amaze me with their never ending strength even while having such charm. To imagine the genicide these women faced shortly after just breaks the heart. Spinach would have been an unheard of luxury. They had to resort to poke salad dug from under the earth. But the remnants of these people are still here and strong as ever, I salute you Southern ladies! There is no mention of water in the stockpot, but then you drain it? Because it’s not necessary. Spinach makes its own juice. Please prepare it exactly as written. I’m confused as well; do you put the drained liquid in the pot that you toss the butter in or do you discard the drained liquid? What do you do with the liquid??? You don’t do anything with it. You simply drain it, following the instructions exactly as they’re written. Were you to add it back to the pot, I would have written that in the instructions. it’d be amazing if you’d share some of the poems and writing from the journal. also: i’m obsessed with your cookbook. it’s what i wished existed 4 years ago when i embarked on my traditional foods journey. making a review video for my youtube channel because the world needs to know; i’ll send it to you when i’m done. blessings jenny! I just made this recipe last Sunday. Bought some heirloom spinach at our local farmer’s market, used grassfed butter and an egg from a local grower…..amazingly good! Who’da thought something some simple could be so delish? Melted in our mouths! Hi, i received my cookbook today and am very exited. i live in israel and many ingredients in regular cook books were never so available here, (maybe more now) and i have also begun to eat whole foods about a year ago. using your site has been great, but the book is very beautiful. Hello! Tried this dish and loved it! Only problem was that after the spinach was wilted there was hardly enough for 2 people even though I used 2 bunches. Did I let them wilt for too long? My mother used to serve this to us, with a little lemon juice or Apple cider vinagar. I believe it had something to do with the citric acid helping our bodies use either the calcium or iron from the spinach. I still think she was ahead of her time! Lost her 11 years ago today – makes it difficult to say happy new year, and mean it. I make something like this, I use coconut oil. I have eaten it for breakfast, lunch or dinner. Spinach is a staple in my kitchen. Many years ago, my mom used to serve spinach with butter and chopped hard boiled eggs, but she included the spinach juices mixed with a little apple cider vinegar. The combination of the tangy vinegar with the somewhat bitterness of the spinach is wonderful. Why do you drain off the liquids? Isn’t that throwing away a lot of nutrients? About the buttered spinach: the 10-20 minute cook time is too long for any spinach. I lived in Asia and all they do there to wilt down the spinach is to put it in the simmering pot and wait no more than 3-minutes and pull it out and rinse it with cold water. Longer cook times means the spinach will lose valuable nutrition into the water. You should reduce this cooking time. Looks wonderful, looking forward to trying this recipe. May I suggest if you are using home grown or local organic spinach not washing it thoroughly with water rather just shaking it out and dusting the very noticeable dirt and grit off with your hands? Lots of good bacteria in dirt that really benefit our gut flora which in return rules our health and helps us stay healthy and prevents sickness! How many does your recipe serve?